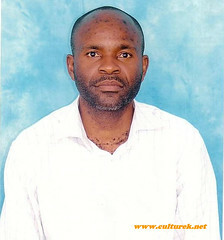 Anthony Mica Katombe (Tony for short) is a blogger from the DRC who’ll “turn 39 April 13”. He has a degree in English and African Cultural Studies Education from a Congolese University. He owns Le Blog du Congolais and co-edits Le Prince du Fleuve Congo, a group blog. On the morning of our messenger chat, gunmen were surrounding his hometown of Kinshasa. And Kofi Annan was visiting in person to check in on a rocky electoral process. Oh and a brief blackout punctuated our messenger chat. But we carried on — in Tony's native French. AB: Vocal members of political parties are quite active in the DRC blogosphere. A Belgian chapter of opposition party UDPS has its own regularly updated blog, UDPS Liege, for example. Do you belong to a political party? TK: I don’t and there are two reasons for that. One, I like to maintain my freedom of opinion and I have no intention of negotiating it with a party. Parties these days are based on their leaders’ personalities or on ethnico-tribal belonging… not on ideology. They only say they’re neo-liberal or socialist for show. Two, I’m a right-winger, a neo-liberal. But in the Congo all the neo-liberal parties are pro-Mobutu. Can you imagine being pro-Mobutu? For now I want to be close to all freedom fighters so I sometimes use my blog to relay UDPS’s struggle. I think they’re good, serious people. But they’re socialists and I’m a liberal. TK: I started blogging in August 2005 after visiting Renouveau Congolais, a [DRC] blog edited by Etienne Ngandu. I figured through a blog I could keep communicating my analyses that I had been publishing in a print publication called Le Phare but with a wider audience. I’d say my blog is more accessible to international readers while Le Phare remains most accessible locally, partly because they rarely update their website. TK: Mainly Congolese from abroad. AB: How do you like blogging so far? TK: It’s actually been as exciting as it’s been demanding. I often get calls or emails from people who want to know all about the country. That forces me to stay tuned to the news 24/7 at a time when things are in constant flux. It’s a challenge and I like that. AB: The DRC blogosphere is one of the most active of Francophone Africa. Why is that do you think? TK: The Congolese are more and more aware of their responsibility for the country’s plight. I hear more and more people say that we couldn’t be who we are without our own participation. So everyone tries to express themselves, to influence things so as to save the Congo. And since freedom of expression is not quite yet a guarantee, people jump on the internet just to be involved. And why are we more vocal than other francophone Africans? Well, there is more suffering here than in Gabon or than in the other Congo. Here people can go 10 years without getting a paycheck. And when they do get a paycheck, it can be for as little as $10 a month. So he who aches the most screams the loudest. AB: What is your blog’s mission? TK: To analyze news and political affairs so as to guide the political involvement of the Congolese diaspora. AB: Was there a defining moment in your life that may have influenced your decision to do what you do? TK: Well, I developed a rebel spirit at age 17. A friend (Fabius Kalongo) was beaten up by some rich kids because he insisted on bathing in the river before them. This was in a rural setting and the custom was first come first serve when it came to bathing. The three rich kids insisted on braving the custom and beat him almost to death. When we found this out at school, I decided to start a fundraiser because he didn’t have any family close by. We went to the hospital to visit him but to our surprise he’d been jailed. We went to the police chief and asked that he be transferred to a hospital but when he refused we threatened to stone the police station’s windows. Our friend was freed but I was expelled from school. You see, someone pegged me wrongfully as the leader. My father, who was also a local bigwig, sided with them against me. I learned that power could be dangerous and I decided to denounce its trappings. There you go! I wish to commend the efforts of Anthony Mica Katombe the blogger from the DRC.His interview with our own Alice Baker is inspiring. Africa need people like him and moreso,the great lake region are dire need of young and purposeful leaders. More greese to your elbow Tony and to the global voice team,i make bold to say: I am proud of you. I’ve just found the following blog on the DR Congo and it covers various current political as well as developmental issues: http://africapositive.blogspot.com/.